That’s a famous quote by….me. I have found it to be undeniably true. From smaller personal goals to the biggest career projects I’ve tried to tackle, things get done much more efficiently when I’ve been able to plan each milestone on the way to the end goal. What’s the most typical tool used to make that happen? Project calendars of course. But is a calendar hanging on your fridge enough? What about flipping through one of those desk calendars? Or syncing everything from your life and work in a Google calendar? In this post, we’ll look at how you can and should use project management calendars to keep your work on track. 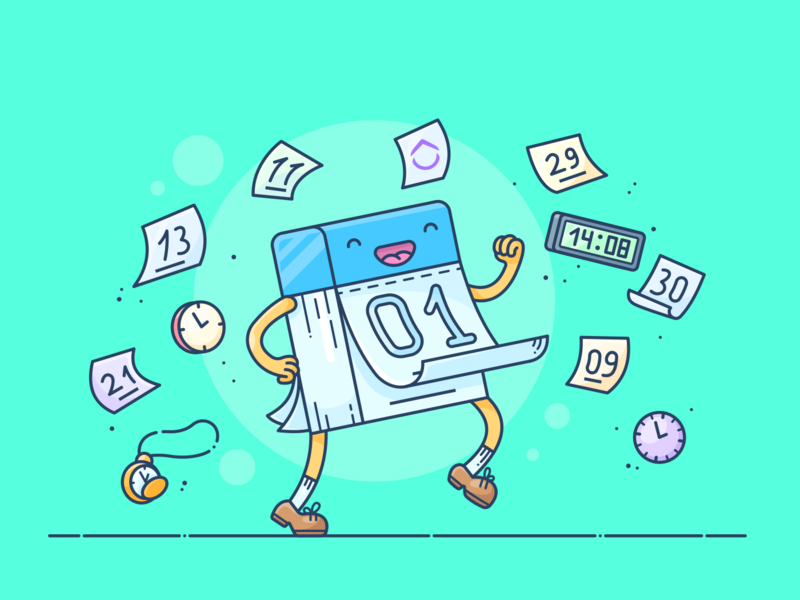 Project Management Calendars: What Are They Good For? This question seems like a joke because anyone who has done any work in their life will know there’s a due date at some point. Something has to be done by a certain time. Sure, sometimes those dates are flexible, or not urgent or not immediate. If you have some smaller tasks on your to-do list that aren’t necessarily dependent on one another or part of an ongoing project, then you can use a task management calendar. In ClickUp, you can see tasks for a certain area (your Lists) or for a whole project. You can also drop in any unscheduled project tasks to add start and due dates. Additionally, you can see if certain people are available and the resources needed for these certain tasks. A project calendar for task management will show you the days and times that your team is scheduled to work on a project in the upcoming days, weeks or months. The times of the day are also crucial, because a certain team, key executive or client may only be available at certain times. It’s also a good idea to add in your milestones and what stage each task needs to be at by a certain day. You may also want to set up your project calendar with assignees and who is responsible for which project tasks. A project calendar is also helpful for determining who is available when. Quickly see what each person is working on, and then schedule the complex projects around their availability. In ClickUp, you can view resources in a proprietary Box view. This shows each person (resource) as a “box”, giving you an easy-to-use insight into who’s available and who isn’t. Adding time estimates to tasks also helps each team member understand the amount of time that a certain project will take, and not only the deadline. Couple this with Time Tracking, and you’ve got accurate insights into where your projects are at. Many teams use Excel for their project management so it makes “sense” to use Excel as a default calendar, right? Yes, you can create calendars in Excel, but that doesn’t mean you should. Excel may work for showing a long-term timeline or vision, but for actually completing tasks and doing the day-to-day work that projects require? No, it makes no sense. The Excel functions and cell sorting are vital functions, but they’re not intuitive for all types of projects. There are ribbons, modules and code. Yes, really code. You have to create your own calendar. Why do this when there are tons of other amazing online project calendars for you to use? Why burden your team members by keeping up with Excel? What software engineer wants to update Excel? What designer wants to update Excel? No, the hard truth about Excel is that project managers and leadership prefer Excel because it’s familiar. This gets passed on to their employees who then feel like they must do work in Excel, too. This cycle of spreadsheets must be stopped. 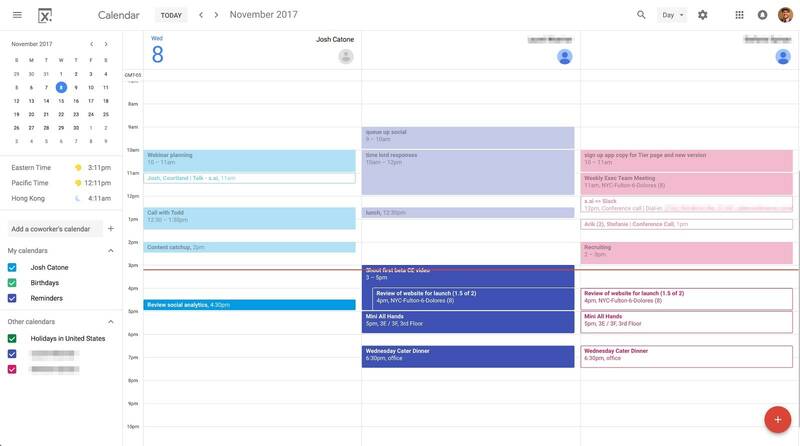 If you already use Google Calendar to manage your meetings and appointments with your work team, then you may be tempted to turn it into a project calendar. But Google Calendar works best as a reminder of upcoming projects, tasks, and events—not as the main avenue for task management. At ClickUp, we even integrate with Google Calendar to create an instant, real-time, 2-way sync for your tasks and projects. Google Calendar even has notifications for upcoming events and integrations with tons of other apps. And you can quickly implement their timeline views much faster than with Excel. What else do you need? Dependencies for one. Google Calendar has no great way to link tasks and projects together. They just show what’s due. Also, you can’t drill down into any task specifics. It’s difficult to keep project details, attachments and to-do lists in Google calendar. It’s not an integrated project management platform. That means you’re still looking at Google Calendar while also using other tools, from to-do list apps to pen and paper. The difference between ClickUp and these other calendars is how fluidly ClickUp works for your whole team. ClickUp’s Time View is the perfect way to visualize important deadlines and plan ahead to complete tasks on time. Break big projects down into more manageable pieces by adding start and due dates to your ClickUp Lists. This will create visual “milestones” on your ClickUp calendar, after which you can drag and drop unscheduled tasks to fall within the dates designated for their parent Lists. The Calendar and Time view in ClickUp show you a high-level view of your task management by day, week and month. Click on one of the tasks in the calendar and open up the details to see the comments and files you may need. 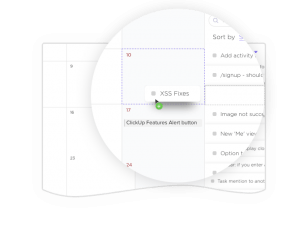 Get a calendar in your project management platform without the friction of Google Calendar or Excel. Utilize ClickUp’s resource management calendar functionality to make sure that you never overbook yourself when setting up your task workflows. Add time estimates to your unscheduled tasks so that when you drop them onto the ClickUp Calendar, the time required to complete each task will automatically be accounted for. It’s simple to schedule any tasks without deadlines, too. ClickUp will even show you unscheduled tasks for certain Projects and Lists that you can drop right onto the calendar. If you want even more timeline info, ClickUp has rolled out Gantt charts. You’ll get an even better understanding of how tasks and projects work together or overlap. It’s free to start with ClickUp as well, putting you on even footing with Excel or Google calendar. Calendars in ClickUp give you a central place for your whole company’s work. Now you know if one department’s company party overlaps with another—and you can adjust accordingly (or attend multiple parties). From campaigns to conferences, align all of your work with ClickUp calendars. As a project management tool, it’s fantastically simple to get started, and you can jump onto the free forever plan! With a project calendar in place, your team collaboration will be a lot better than it is now. But even if you have the greatest system in place, that doesn’t mean you’ll get the job done. You’ll still have to follow what the calendar says and do the work. Part of what makes a project calendar so valuable is that it’s simple to visualize what you have to do and when. Set a deadline and do it.